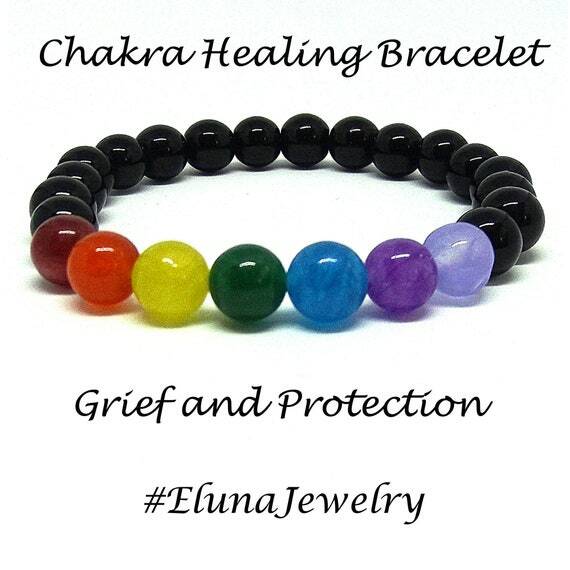 This Chakra stretch bracelet is the perfect addition to your minimalist bracelet collection. Designed to balance your energy, this bracelet will help you restore your spirit. The energy of this bracelet blends well with other stones and our beaded stretch bracelets are meant to be classic enough for everyday wear. Wear these bracelets yourself or give them as a gift to someone you love! At Eluna Jewelry, we take pride in the details and love we pour into everything we make. We know you’ll find something lovely for yourself or to give as a gift to someone special! •All the gemstones used in each bracelet have been cleansed, charged and finally smudged with sacred incense. The smudging releases any negative energy on the stones allowing positive energy to replace it so that the bracelet will be ready to wear. ☯For the Crown Chakra--Lilac Jade is a guardian stone that connects you to the universe and spiritual consciousness. ☯For the Third Eye Chakra--Blue Jade harmonizes mind, body, and spirit bringing inner wisdom. ☯For the Throat Chakra--Aqua Jade brings calmness to you and symbolizes self-expression. ☯For the Heart Chakra--Green Jade enhances relationships and attracts loving friends. ☯For the Solar Plexus Chakra--Yellow Jade brings forth your intellect, strengthens your will and personal power. ☯For the Base Chakra--Red Jade helps you open your heart. ☯Black Onyx is a very strong stone of protection. It absorbs and transforms negative energy, preventing the drain of your personal energy. This stone is especially useful in times of stress, confusion or grief. Due to the nature of gemstones, some variations may occur in the coloration or patterns of these bracelets. These 1/2 inch purple hoop earrings are wonderful. They are made from 100% niobium wire that has been anodized to create this beautiful purple coloring. Since the metal is anodized, the color will not wash away. The metal is permanently colored with this purple coloring. Each earring is handcrafted by myself in my studio. I design each of these hoops to be approximately 1/2 inch in diameter. Niobium is considered to be a hypo-allergenic metal by the American Academy of Dermatology. 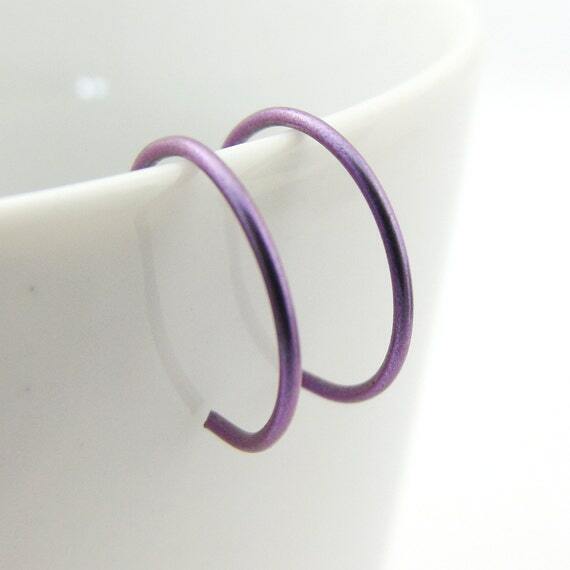 These purple niobium hoops are created in a reverse hoop style. Why reverse hoops? I love this style because they are super light and super comfortable (I have even forgotten to take them off before bed, and fallen asleep wearing reverse hoops)! The hoop earrings are inserted into the back of your earring piercing, and then gently tugged forward until you feel the catch touching the back of your earlobe. 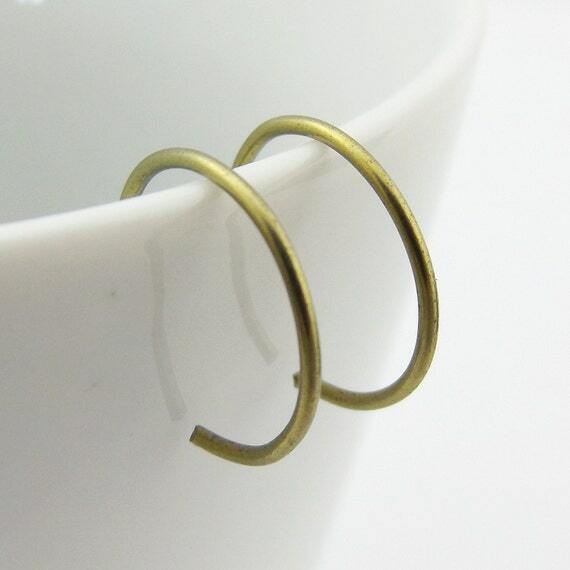 These elegant thin hoops are lightweight and designed for a standard piercing. This means they will not tear or stretch your earring holes. If you would like to see how to wear these reverse niobium hoop earrings, please visit my video demonstrating how these are worn. These 1/2 inch golden yellow hoop earrings are wonderful. They are made from 100% niobium wire that has been anodized to create this beautiful yellow coloring. Since the metal is anodized, the color will not wash away. The metal is permanently colored with this golden yellow coloring. These yellow niobium hoops are created in a reverse hoop style. Why reverse hoops? I love this style because they are super light and super comfortable (I have even forgotten to take them off before bed, and fallen asleep wearing reverse hoops)! The hoop earrings are inserted into the back of your earring piercing, and then gently tugged forward until you feel the catch touching the back of your earlobe. 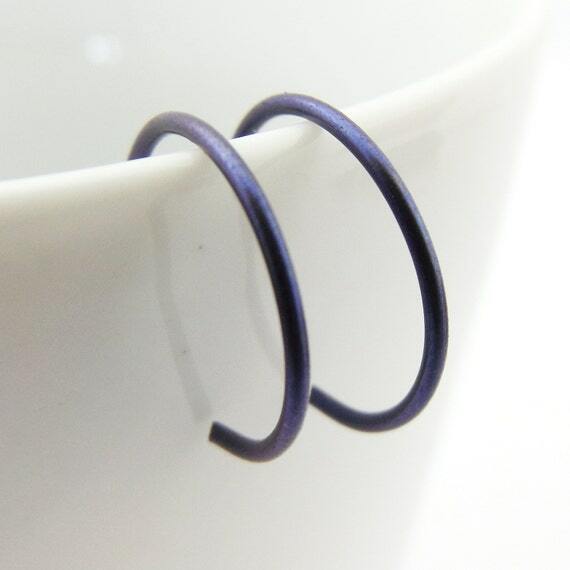 These 1/2 inch cobalt blue hoop earrings are wonderful. They are made from 100% niobium wire that has been anodized to create this beautiful cobalt blue coloring. Since the metal is anodized, the color will not wash away. The metal is permanently colored with this cobalt blue coloring. These cobalt blue niobium hoops are created in a reverse hoop style. Why reverse hoops? I love this style because they are super light and super comfortable (I have even forgotten to take them off before bed, and fallen asleep wearing reverse hoops)! The hoop earrings are inserted into the back of your earring piercing, and then gently tugged forward until you feel the catch touching the back of your earlobe. These 1/2 inch blue hoop earrings are wonderful. They are made from 100% niobium wire that has been anodized to create this beautiful peacock blue coloring. Since the metal is anodized, the color will not wash away. The metal is permanently colored with this peacock blue coloring. 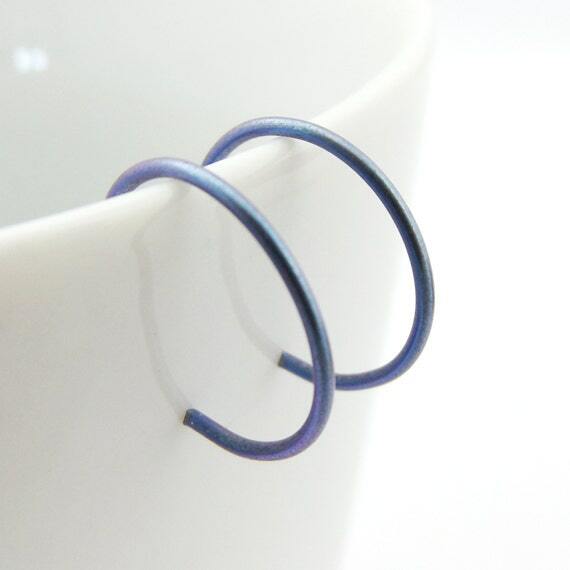 These blue niobium hoops are created in a reverse hoop style. Why reverse hoops? I love this style because they are super light and super comfortable (I have even forgotten to take them off before bed, and fallen asleep wearing reverse hoops)! The hoop earrings are inserted into the back of your earring piercing, and then gently tugged forward until you feel the catch touching the back of your earlobe.